In a food processor, grind first 8 ingredients plus half of the sunflower seeds until smooth. Transfer to large mixing bowl. Add remainder of seeds and all the nuts to processor and coarsely chop with a few quick pulses. Add nut mixture to apple mixture in bowl. Stir in cranberries. 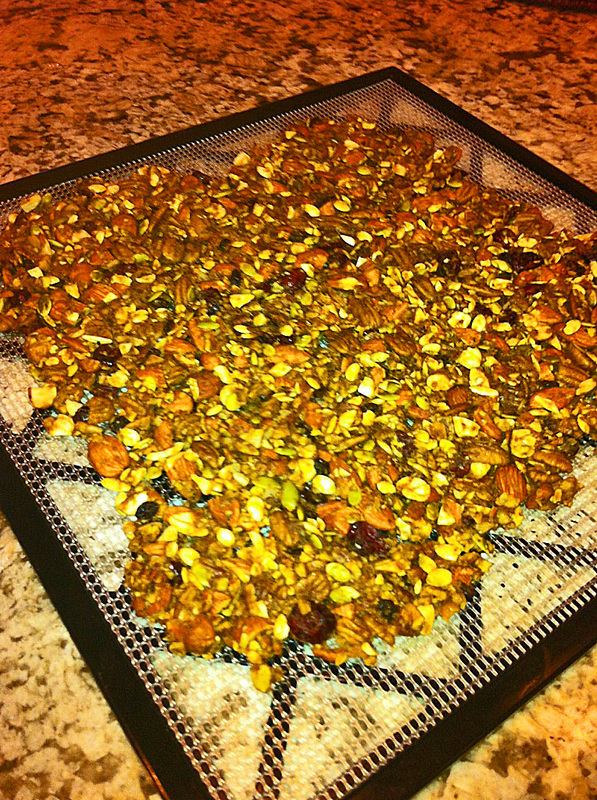 Spread the granola on teflex lined dehydrator trays and dehydrate at 115 for 6-8 hours. Flip granola over to screens and remove teflex. Dehydrate for another 6-8 hours or until crunchy. Makes approximately 3 quarts and freezes beautifully. This entry was posted on May 8, 2015 by thrivecoach12 in Desserts/Snacks and tagged Dehydrator Recipe, Fairview Heights Nutrition, Pam Faulkner Recipes, Raw Granola Recipe, Thrive Coach 12 Recipes.